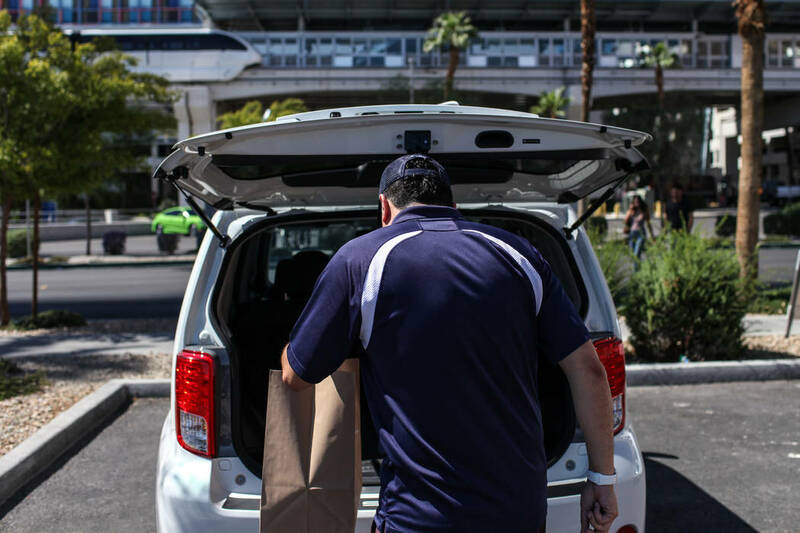 Dropoff, a same-day delivery service for businesses, launches Tuesday in Las Vegas. With more same-day-delivery services popping up, who says you can’t always get what you want? 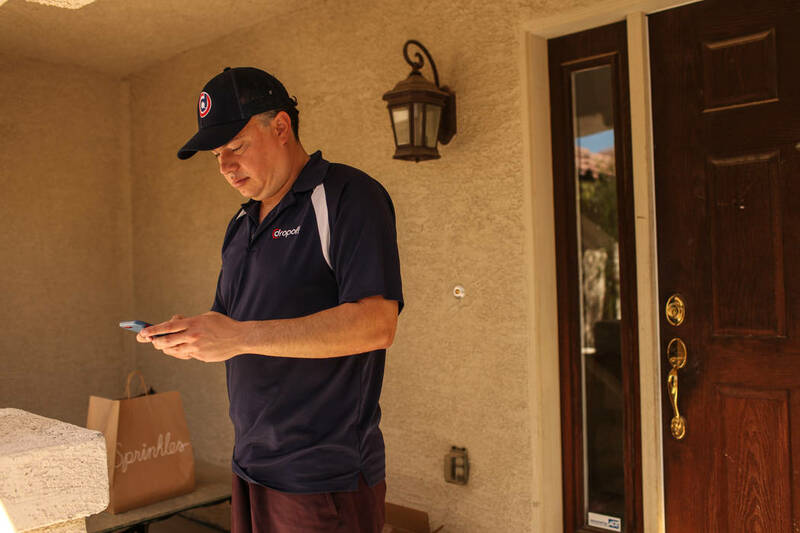 It’s just a matter of time before more local businesses add same-day delivery service, said Brian Gordon, co-owner of Las Vegas research and consulting firm Applied Analysis. 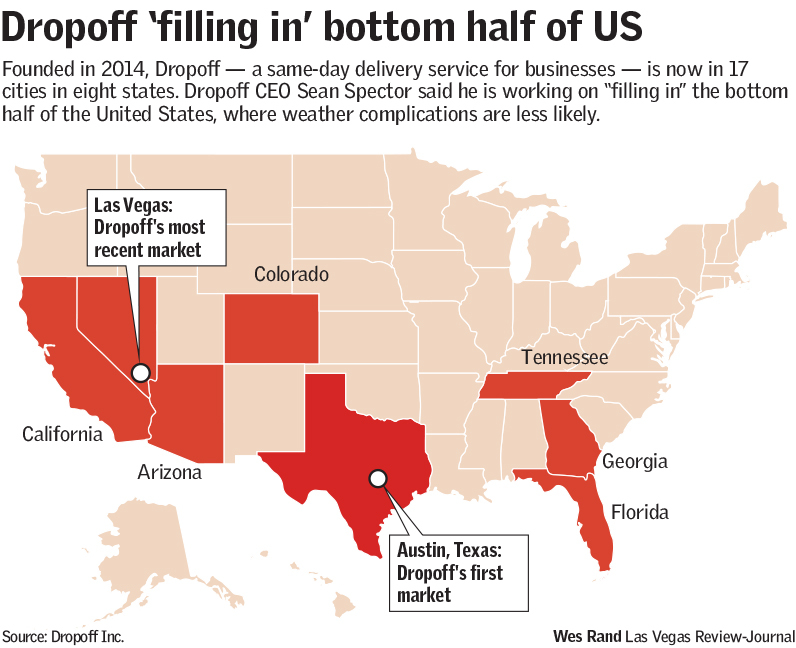 Austin-based startup Dropoff Inc. may speed up the trend locally. 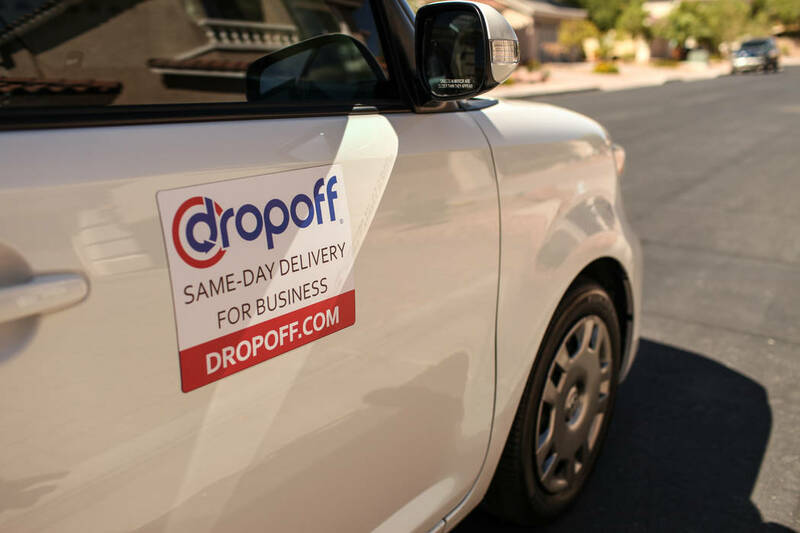 Dropoff, a same-day delivery service for businesses, officially launches Tuesday in Las Vegas. “The way that you think of FedEx and UPS for overnight is the way to think of Dropoff, but for same-day (delivery),” said Dropoff CEO Sean Spector. Unlike the case with other same-day-delivery services like UberRush or Postmates, you won’t be the one to put in the order delivery with Dropoff. “So for Sprinkles, you as a consumer would go to Sprinkles.com, you would order a dozen cupcakes to be delivered to your office, and then Sprinkles puts the order into our system, and then we pick it up and deliver it at the designated time that we’ve all agreed to,” Spector said. 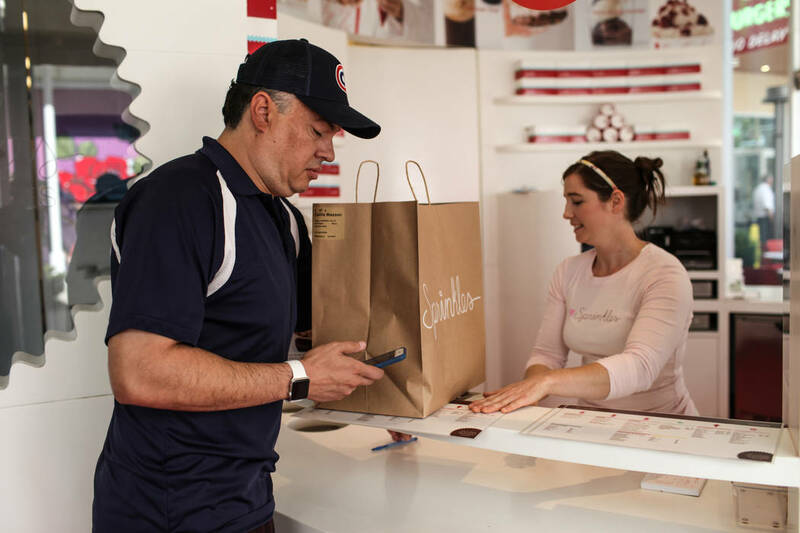 Sprinkles is the company’s first — and so far only — corporate partner in Las Vegas, though Spector said he has a few deals with other partners in the works. But similar to services like UberRush, it is independent contractors who will be actually driving and making deliveries. However, they will be uniformed. The independent contractors also have a more detailed “screening process” than other services, Spector said, which he said can take up to 10 days rather than several hours. Spector said the company is “always hiring” but declined to give the number of drivers needed in Las Vegas or the number of drivers in any other markets. Spector said Dropoff is focused on working with partners in food and grocery, retail, health care, industrial and commercial, and business services. All drivers will be in compliance with the Health Insurance Portability and Accountability Act, he said, allowing drivers to deliver medications to patients or deliver medical supplies to hospitals or a doctor’s office. “Health care is fast-growing industry, and it’s one that’s starting to use same-day delivery more and more,” Spector said. Rob Dyer, senior vice president of strategy and development for HCA Healthcare’s far west division, said the hospital system currently has its own internal system for same-day delivery of medical supplies but does not have an internal system to deliver medications to patients at home. He said he would be open to anything that could improve the patient experience. Spector said Dropoff could also be used as a courier service to deliver a specific part for an airplane in a scenario that an airplane has been delayed due to a maintenance problem. Dropoff may also add a Las Vegas flavor and work with the construction and hospitality industries, which a local construction company said would be beneficial. 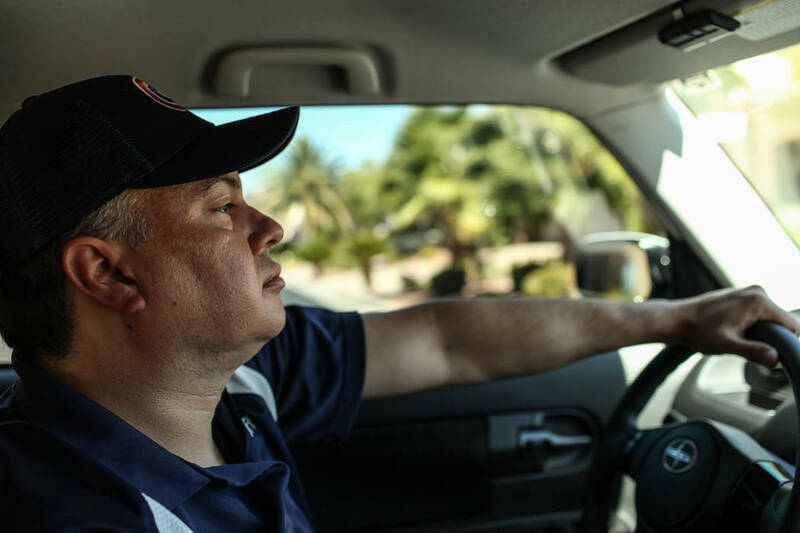 There are only a handful of local same-day delivery service companies in Las Vegas, including Aztec Couriers LLC. “More and more business in Las Vegas are needing things delivered the same day,” owner Barbara Jensen said, adding that the city is growing larger every day and “there’s enough business” to go around. “Dropoff will do very well here,” she said, adding that the company will more than likely already have some base customers from the markets they already operate in. “It looks like they are very up to date on new technology, such as tracking the drivers locations where the customer can see exactly where the package is at all times. I am very impressed,” she said, jokingly adding that she knows what her backup plan might be if she needs one.